Rep. Kurt Schrader warns winter steelhead face 90% extinction risk in Willamette River. 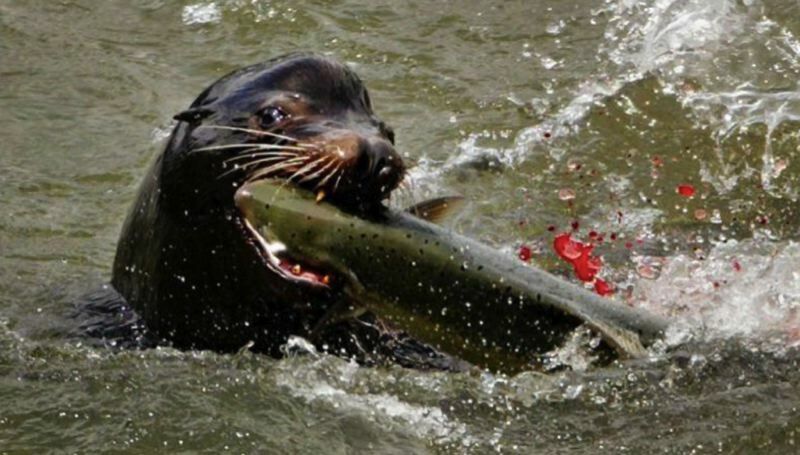 A bipartisan bill designed to save salmon species by culling the California sea lions who gulp them down has cleared the U.S. House of Representatives. The Endangered Salmon and Fisheries Predation Prevention Act — which was introduced by Reps. Kurt Schrader, D-Oregon, and Jaime Herrera Beutler, R-Washington — passed the House 288 to 116 in late June. "Salmon are an important part of the culture, identity and the economy of the people and tribes of the Pacific Northwest," Rep. Schrader said in a speech on the House floor. "It is one of the reasons why we've, as a region, put so much time, energy and resources into protecting and recovering these iconic fish." The latest text of the bill would appoint members of local Indian tribes to remove from the Columbia River and its tributaries as much as 10 percent of the "potential biological removal level," a technical term that refers to the number of animals that can be killed while still maintaining a sustainable population. While the Oregon Department of Fish and Wildlife has estimated that the winter run of steelhead in the Willamette River faces a 90 percent chance of extinction if nothing changes, the proposal has generated strong pushback from national environmental organizations. Naomi Rose, a marine mammal biologist with the Animal Welfare Institute, called the bill "scapegoating" of a species that was nearly extinguished when commercial hunting of sea lions was encouraged during much of the last century. "These animals will die for nothing," Rose said in a phone interview. "Humans remove a lot more fish than the sea lions do." Rose described the claim that California sea lions are invading their nonnative habitat as "a lie" and said passing the bill altering the Marine Mammal Protection Act of 1972 would lead to killing other species like the grey seal on the East Coast. She said killing natural predators should only be part of a comprehensive solution involving dam removals and reductions of commercial and recreational fishing. The government already kills some sea lions at Bonneville Dam each year, but must check off a number of time-consuming criteria for each critter. A policy analyst for ODFW told the Tribune in May the captured animals are put in a cage and given the same euthanasia used on humans, then shot with a gun as a back-up measure.